Since 1977, GlassWorks has become one of the leading glass shower doors provider in Palos Heights, Illinois. You can select from a broad array of doors to find one that matches your tastes. Have an expert installer put in a new set of glass doors to your bathroom. Below is a listing of different glass shower doors we offer. Frameless glass shower doors are GlassWorks’ most common glass shower doors. Frameless Shower Enclosures are in demand due to their structured and clean look, incredible spa-like-feel, and ease of maintenance and cleaning. We start by examining the current situation of your bathroom. Then our professionals will work together with you to offer a design and layout that upgrades both the look and performance of your whole bathroom. Since we have over 35 years of experience, we can offer ideas and develop designs that other companies cannot. GlassWorks’ Neo-Angle Glass Shower doors include character, while conserving room in compact washroom formats. As a result of the intricacy involved, GlassWorks is a sector leader in creating, engineering and installing neo-angle glass shower doors for our clients. Like our frameless glass shower doors, we start by evaluating your area at home. Our design specialist will certainly deal with you to supply a layout and format that makes best use of the look and performance of your whole washroom. As a result of our know-how, we can supply style suggestions and impressive touches others simply never ever consider. GlassWorks’ Steam Enclosures produce a medical spa encounter in your own house by taking your shower encounter to a whole brand-new value. At GlassWorks, we have actually developed cutting-edge styles to make best use of the steam bath experience. As part of our layout procedure, we will use our experience to provide you with the most professional and impressive glass steam shower enclosures. Splash Panels and Shower Shields provide an unique alternative to standard bath rooms and doors. These doorless units supply an open, minimalist design for your tub or bath and could be made use of to liberate area while still offering a dramatic bath experience. GlassWorks’ splash panels and shower shields come in bi-fold and fixed panel designs. Our dealt with panel offers one immobile splash guard, while the bi-fold splash panel style supplies one fixed panel and a 2nd one that could fold up out of the way to permit very easy accessibility to the faucet. GlassWorks’ framed glass shower doors add a striking layout and level of surface that you will enjoy at home for many years to come. We collaborate with professionals, architects and specialists ahead up with designs that set our work apart in a Framed Shower Enclosure application. GlassWorks has actually transformed the typical sliding glass shower doors by supplying impressive “all-glass” frameless looks and the newest equipment. Hydro-slide hardware practically getting rid of any type of apparent hardware and enabling the usage of 3/8″ thick glass. Serenity and pipe designs providing innovative exposed tracks and tires. Curved moving glass walls that wrap the shower enclosure. Allow us demonstrate how we can make our Sliding Doors the most discussed elements at home. 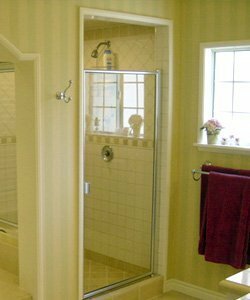 Although each of our showers is customizeded, some bath doors are one-of-a- kind adequate to require placement in the GlassWorks– Truly Custom Category. 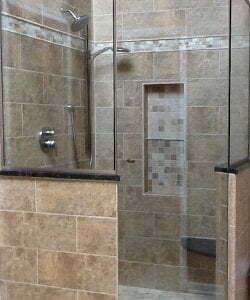 Our layout specialists will make your goal a truth if you are looking for something absolutely one-of-a-kind for your custom glass shower doors.